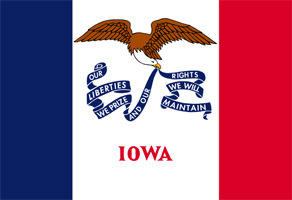 Iowa is a US state located in the Midwestern region of the USA. The capital of Iowa is Des Moines, which is also the state’s largest city. Iowa got its name from the Ioway people, who were Native American tribes that occupied the area during the European exploration. It became the part of the French colony in the year 1673. US gained control by 1803 after the Louisiana Purchase. Today, Iowa has a total population of 3,002,555. Iowa is stated as one of the safest states in the USA to live. The state of Iowa is known as part of ‘the American Heartland’ and often called the ‘Food Capital of the World’. In fact, the state of Iowa produced 1/10 of the whole nation’s food supply. Iowa is largely an agricultural state, worth over US $10 billion annually. Iowa is the leading producer of hog, soybean, corn, lumber and walnut. Major mineral products like cement, limestone, gravel, coal and sand were largely produced. Ironically, despite it being an agricultural state, the worth of Iowa’s manufactured products is twice as large as its agricultural products. Major industries in the state include food processing, biotechnology, electrical equipment, machinery, financial services, printing and publishing. Indeed, Iowa is rich not only in cuisine, but also in culture, economy and landscape. Major tourist attractions in Iowa include the Amana Colonies, the Fort Dodge Historical Museum, the Herbert Hoover birthplace & library, the Effigy Mounds National Monument and the Iowa State Fair (held in Des Moines every August).